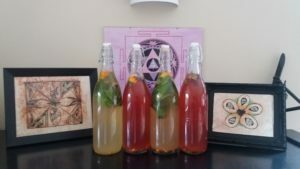 Two Ways to Recognize, the difference between real and fake Kombucha! Look for that little Kombucha Culture or any strains of yeast floating in your bottle. If you don’t find them in there then the Kombucha you are drinking is fake. Notice the taste of the Kombucha. Does it taste like sweetened soda water with some flavourings (FAKE) or does it have that full bodied flavour and tangy-zing to it with fizz that makes your taste buds dance (REAL). Unfortunately most Kombucha drinks that are out there in the shops and health foods stores that I have tried are weak, full of carbonated water, sugar and some flavourings. When it comes to my (Ayurveda Mandala) Kombucha Products, they are as real and as you can get. They have that refreshing tangy – fizziness, a medley of various flavours from real spices, herbs (like kawakawa, mints), flowers like (lavender, calendula, rose), fruits, lemon, ginger and turmeric – making it taste full-bodied, nourishing and rich. You will also see the strains of kombucha culture floating in the bottle. I have been brewing Kombucha since 15 years and in the meantime have tried various kombuchas in the market to see what they are offering. So I really know this stuff inside out! Don’t Believe everything you read or hear, question it! Unfortunately there are companies in the wellness market who like to make profits by taking advantage of trends that keep coming and going. They are not offering the real thing, rather making it up. This age old nourishing health promoting drink has always been there and will go on regardless of the fads. One needs to be vigilant and use their own common sense and not believe everything that is apparently “healthy” out there. Come and try my Kombucha! I am glad that I am able to offer the REAL with all its deliciousness, richness and wholesome-ness. I have various flavours depending on the herbs I use. More info about Kombucha and its health beneifts can be read on my blog post here. Below are the five unique and amazing flavours that I have created.